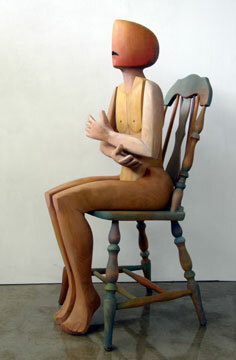 Painted wood, 2007, 17" x 20" x 43". Resiliency is the ability to recover from or adjust to misfortune or change, to bounce back in the face of adversity, to see beyond today’s pain to a better tomorrow. I was fortunate to hear Mervlyn Kitashima speak on resiliency. In 2003, she was named National Mother of the year. Mervlyn was born on the island of Kauai in 1955, one of 687 babies tracked from in utero through their early 30's for a comprehensive longitudinal study on resiliency.5 The study identified factors that put children at risk, but more importantly it discovered resiliency traits and skills that could be fostered to buffer them from the adversity permeating their lives. Growing up, Mervlyn did not know of the study. She lived one day at a time, trying to survive, trying to thrive. She was a child at risk, or as she prefers - a child of promise. When asked how she overcame the odds, she says she knew how to work. She had a grandmother who loved her, to whom she could run across the cane fields and feel safe for a time. She had a sense of purpose, a belief that life could be better and she was given challenges and opportunities by people with high expectations who considered her worthy, full of promise. Resiliency is built one smile of encouragement, one safe haven, one skill mastered, one dream at a time. On an airplane we are instructed to put on our own oxygen mask first. In life we must first nurture resiliency in ourselves, then we must nurture it in others.